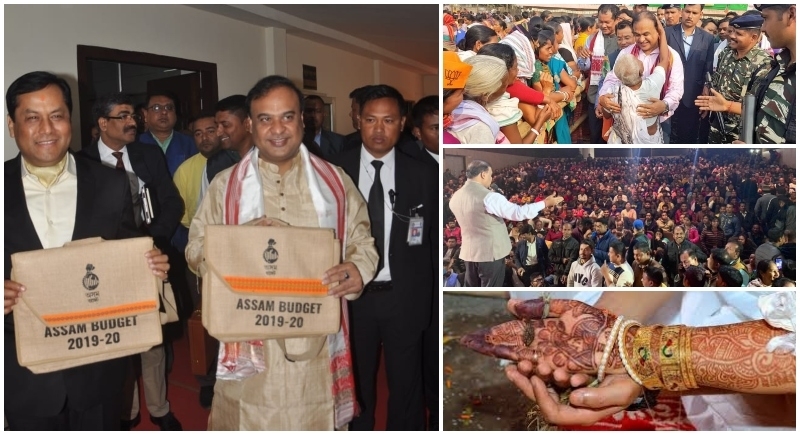 Guwahati, February 6: Presenting the fourth budget of the state for the fiscal year 2019-20 in the Legislative Assembly, Assam Finance Minister Himanta Biswa Sarma placed forward by launching new schemes benefitting the people. The budget aims at helping the poor, enhancing development for the students by enabling considerate stipends, transportation, infrastructure etc. The revenue earning of the state has increased by 20 per cent by creating a new mark in total expenditure which has crossed 70,000 crore. Benefitting the students who passes XII examination with first division to get e-bike. Children of families earning less than Rs. 2 lakh p.a to get free textbooks upto university level. All college students from tea garden community to get Rs 10,000 monthly stipend. Implemented under the Indira Miri Universal Widow Pension Scheme and dedicating it to the Indira Miri, the Assam government has slated the Immediate Family Assistance wherein any woman who loses her husband, upto the age of 45 years will receive a lump sum amount of Rs 25,000. This will help to support the family tide over the financial vacuum that is often created by the loss of the bread earner of the family, which is usually the male member of the household. For Brides belonging to families earning less than Rs 5 lakh p.a , the govt will give one tola gold, at about Rs 38,000. Launching a new scheme, rice would be sold at Rs 1 per kg to benefit 53 lakh families. The government aims to launch of Bhasha Gaurav Achoni scheme for the protection and promotion of tribal languages of the state. During FY 2019-20, I would like to continue with 2 imp schemes. Farmers will continue to get 25% subsidy on short term crop loans against #KisanCreditCards up to max limit of Rs 25,000. The 2nd scheme is to continue with #ZeroInterest on short term crop loans up to Rs 2 lakh. The state government has sanctioned Rs 25 crore for development of tombs of Ahom Kings as tourist attraction. Rs 155 crore given for the renovation of Batadrava. Village headmen to get smartphones to stay connected with the district administration. One time cash incentive worth Rs 50,000 for a total of 2000 sports and arts personalities for their contribution. Proposal to mitigate 380 arsenic affected habitations and 7 fluoride affected habitations. Fiscal deficit rises to 3.2 per cent in 2017-18 from 2.4 per cent in 2016-17, primarily due to the implementation of 7th Pay Commission. Threshold limit for the registration under GST for suppliers of goods enhanced to Rs. 40 lakh. For MSME sector, annual turnover limit for availing Composition Scheme enhanced to Rs 1.5 crore. Budget of estimated Rs. 99418.91 crore, but no additional tax. Rs 79742.26 crore on revenue account and Rs 19676.65 crore on capital account.